I'll do my best to add a new photo to this gallery each day! I appreciate any comments on my photos! August 22nd - "Black and White" "I don't often convert my photos to Black and White, but when I do I make sure there is a lot of lightning in the image." :) Dallas, TX Technical Details: Shot with Canon 5d MK2 and Canon 70-200Llens. Aperature F5 and shutter speed 5 seconds. August 21st - "Bombardment" This is another shot from this past Friday night. What a night to be shooting lightning! This is a stack of 8 images all taken within about 10 minutes of each other. Dallas, TX Technical Details: Shot with Canon 5d MK2 and Canon 70-200Llens. Aperature F5 and shutter speed 5 seconds. August 20th - "Electric Sky" Dallas, TX In 2011 in Dallas we had over 70 days where the temperature was 100 or more. In 2012 we had a welcome break in June and August with a lot of rain and storms. 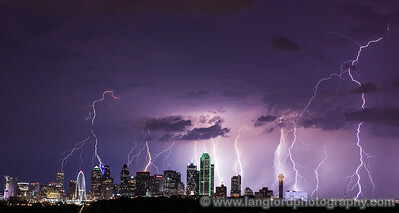 I shot this image in mid August, normally a very dry and hot period in Dallas. What a night! 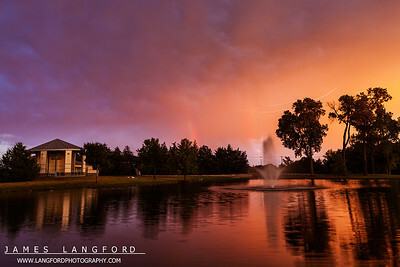 This is a stack of 6 images shot within 10 minutes of each other. Technical Details: Shot with Canon 5d MK2 and Canon 70-200L lens. Aperature F5 and 5 second exposure time. 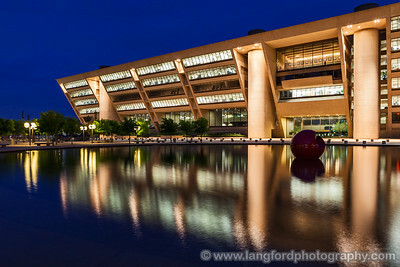 August 10th - "Dallas City Hall" Dallas, TX Technical Details: Shot with a Canon 5d Mk2 and a Canon 24-70mm lens at F8 and 15 seconds. 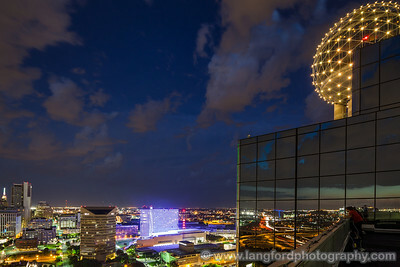 August 9th - "Big D" Dallas, TX It's been a few weeks since I've been able to contribute anything to my Daily Gallery. Work has been keeping me very busy but I was finally able to get out last night and shoot the Dallas skyline, my favorite subject. :) Technical Details: Shot with a Canon 5d Mk2 and a Canon 24-70mm lens at F8 and 15 seconds. Pano created from 8 vertical shots. 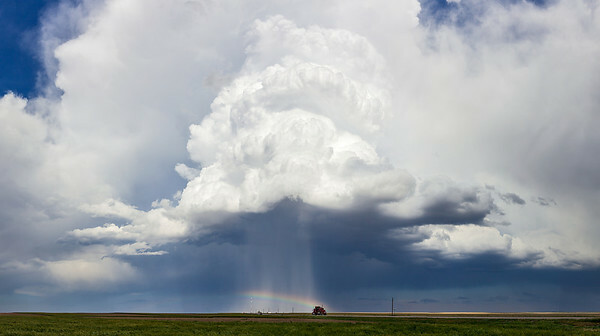 August 2nd - "Downburst Rainbow" Northern Colorado Technical Details: Shot with Canon 5d mk2 and Canon 24-70mm lens at F10 and 1/8. Panorama created from 8 vertical. July 31st - "Scenic Overlook" Dallas, TX While shooting the skyline one right we were lucky enough to have a couple come up to enjoy the view with us. Technical Details: Shot with Canon 5d MK2 and Canon 17mm T&S lens. July 25th - "Big D" Dallas, TX There is something incredibly peaceful about being on top of a building overlooking a busy city as the sweet light of evening comes on. Even with all the hustle, bustle and noise of the city places can be found that offer a breathtaking vantage point. Technical Details: Shot with a Canon 5d Mk2 and a Canon 24-70mm lens at F10 and 30 seconds. 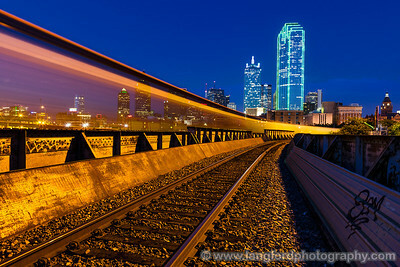 July 24th - "Just Passin' Through" Dallas, TX A good friend shared this location for shooting the Dallas skyline with me yesterday. What a view! It was made even better when a freight train passed by. The cars had gaps in them allowing the skyline to show through. Technical Details: Shot with a Canon 5d Mk2 and a Canon 24-70mm lens at F10 and 30 seconds. July 23rd - "Big D" Dallas, TX There is something incredibly peaceful about being on top of a building overlooking a busy city as the sweet light of evening comes on. Even with all the hustle, bustle and noise of the city places can be found that offer a breathtaking vantage point. Technical Details: Shot with a Canon 5d Mk2 and a Canon 24-70mm lens at F10 and 30 seconds. July 17th - "A Little Bit of Everything" Allen, MT Sometimes you get lucky. On this night a dieing storm was putting down some very infrequent lightning. 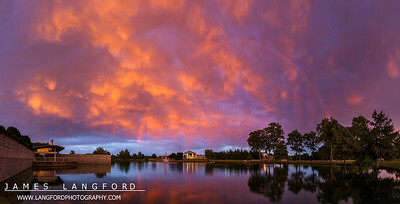 The setting sun added some incredible colors into the sky against the double rainbow from the light rain. Technical Details: Shot with Canon 5D MK2 and Canon 24-70L lens at F10 and 1/60 seconds. July 16th - "The Promise" Allen, TX Genesis 9:12-17 - And God said: "This is the sign of the covenant which I make between Me and you, and every living creature that is with you, for perpetual generations: I set My rainbow in the cloud, and it shall be for the sign of the covenant between Me and the earth. It shall be, when I bring a cloud over the earth, that the rainbow shall be seen in the cloud; and I will remember My covenant which is between Me and you and every living creature of all flesh; the waters shall never again become a flood to destroy all flesh. The rainbow shall be in the cloud, and I will look on it to remember the everlasting covenant between God and every living creature of all flesh that is on the earth." Technical Details: Shot with Canon 5d MK2 and Canon 24-70mmlens at F10 and 1/10 seconds. Pano created from 10 vertical shots. July 13th - "The Leading Edge" Rapid City, SD This is the leading edge of a strong outflow driven thunderstorm near Rapid City, SD. Technical Details: Shot with Canon 5d MK2 and Canon 24-70mmlens at F10 and 1/60 seconds. July 12th - "LightningAgeddon" Aspermont, TX Storm chasing can be very frustrating. On this day we had been chasing storms in West TX. We had seen nothing all day and were gettting discouraged. A large storm developed several hours to our west, causing us to have to relocate even further from home to get to it. When we arrived this is what we were greeted with. It made the whole trip worthwhile. This image is a composite of around 10 minutes worth of lightning. Technical Details: Shot with Canon 5d MK2 and Canon 24-70mm lens at F5 and 5 seconds. 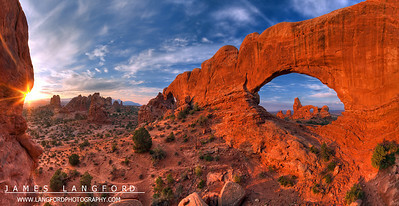 July 11th - "Turret Arch" Arches National Park, UT It is possible to capture Turret Arch through The North Windows arch, creating this amazing scene. To get to this location, you have to climb through the North Window and scramble up some rocks. This is one of the best views within Arches National Park, in my opinion. Technical Details: Shot with a Canon 5d Mk2 and a Canon 20mm prime lens at F16. Bracketted images stitched and merged to create a wider dynamic range. July 10th - "Reflection Perfection" Glacier National Park, MT Technical Details: Shot with Canon 30D and Canon 10-22mm lens at F10 and 1/60. Panorama created from 10 vertical shots. 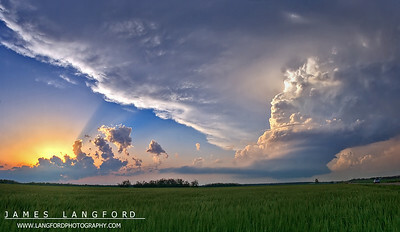 July 6th - "Green Monster Core" South-Western Oklahoma One of my favorite hobbies after photography is storm chasing. 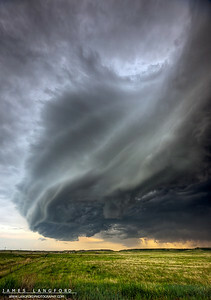 Experiencing the power and beauty of thunderstorms is something that is really hard to translate into images. My chase partner and I came upon this HP supercell in South-Western Oklahoma one evening. The rain and hail in the core of the storm gave it this amazing green light. You couldn't even see the colors until the storm was practically on top of you. Technical Details: Shot with Canon 30D and Canon 10-22mm lens at F10 and 1/8. Panorama created from 24 vertical bracketted shots. 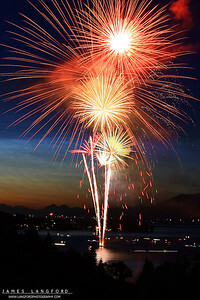 July 5th - "Independence Day" Flathead Lake, MT I love fireworks! Ever since I was a kid I loved the celebrating the 4th of July and experiencing the excitement of fireworks. As I have grown older I have found a new way to experience fireworks by capturing them with my camera. I shot this image a few years back while visiting my family in Montana. I camped out at this spot for 2 hours to secure this view. Technical Details: Shot with Canon 30D and Canon 20mm lens at F10 and 10 seconds. July 3rd - "Towers of the Virgin" Zion National Park, UT Zion National Park has some of the most amazing and rugged mountains and cliffs you will see anywhere. This particular location is just behind the visitor center as you enter the park from the South. 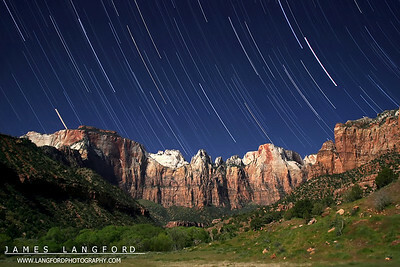 A friend and I sat here for two hours shooting star trails with the full moon behind us to get this image. Technical Details: Shot with Canon 10D and Canon 20mm lens at F2.8 and 30 seconds. July 2nd - "Oklahoma LP Supercell" Oklahoma, OK This is one of my favorite storm photos. This is a Low Precipitation (LP) supercell that formed just south of Oklahoma City. We tracked it through town and then to the North East. As we came upon this field of wheat I knew that it was time to stop and get some pictures. Technical Details: Shot with Canon 10D and Canon 20mm lens at F10 and 1/8. Panorama created from 6 horizontal shots. June 27th - "Another Glorious Morning in the Tetons" Grand Teton National Park, WY I captured this while visiting Grand Teton National Park a few years back. I wanted to capture the grandeur and scale of this scene, and so chose to shoot in a panormaic format. I wanted a slightly different view on this beautiful old barn, and chose to incorporate the path and wall to more fully pull the viewer into the scene. Technical Details: Shot with Canon 10D and Canon 20mm lens at F10 and 1/8. Panorama created from 6 horizontal shots. 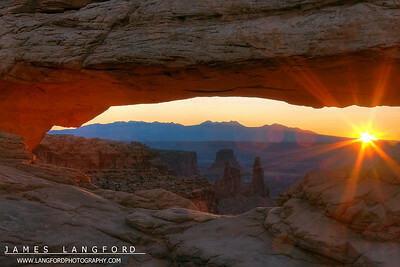 June 26th - "Mesa Arch Sunrise" Canyonlands National Park, UT Mesa Arch is an iconic location in Canyonlands National Park. On any given morning, you can expect tons of photographers there capturing the sunrise. On this particular morning, I arrived a full hour before sunrise to secure my spot in front of this small arch. It's a beautiful thing to experience. Technical Details: Shot with Canon 10D and Canon 20mm lens at F10 and 1/8. Panorama created from 6 horizontal shots. June 25th - "Misty Morning at Maroon Bells" Maroon Bells National Recreation Area, CO The Maroon Bells area is located just East of the town of Aspen, Colorado. In the fall, the aspens in this area turn a billiant yellow. 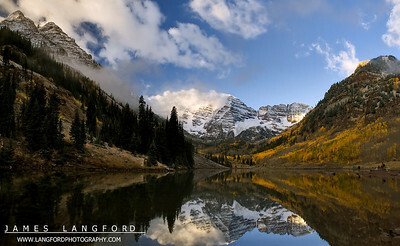 I went here several times during my trip to Colorado, and experienced different conditions each time. On this morning, fog covered the whole valley when I first arrived. As it started to get later, the fog mostly burned off leaving this beautiful scene. Technical Details: Shot with Canon 30D and 20mm lens at F16 and 1/40. Panorama created from 6 vertical bracketted shots. Storm chasing can be very frustrating. On this day we had been chasing storms in West TX. We had seen nothing all day and were gettting discouraged. A large storm developed several hours to our west, causing us to have to relocate even further from home to get to it. When we arrived this is what we were greeted with. It made the whole trip worthwhile. 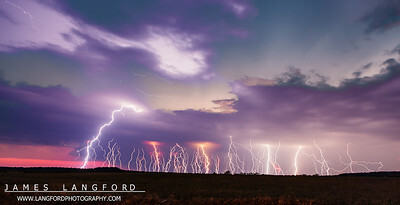 This image is a composite of around 10 minutes worth of lightning. Technical Details: Shot with Canon 5d MK2 and Canon 24-70mm lens at F5 and 5 seconds.